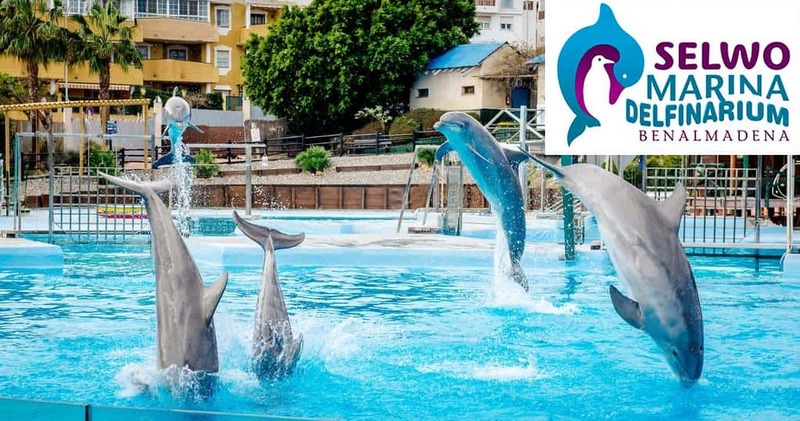 The Costa del Sol has a few theme parks, among them we can highlight Selwo Marina in Benalmadena, the largest dolphinarium and ice penguin colony in Andalusia, an aquarium that you cannot miss. 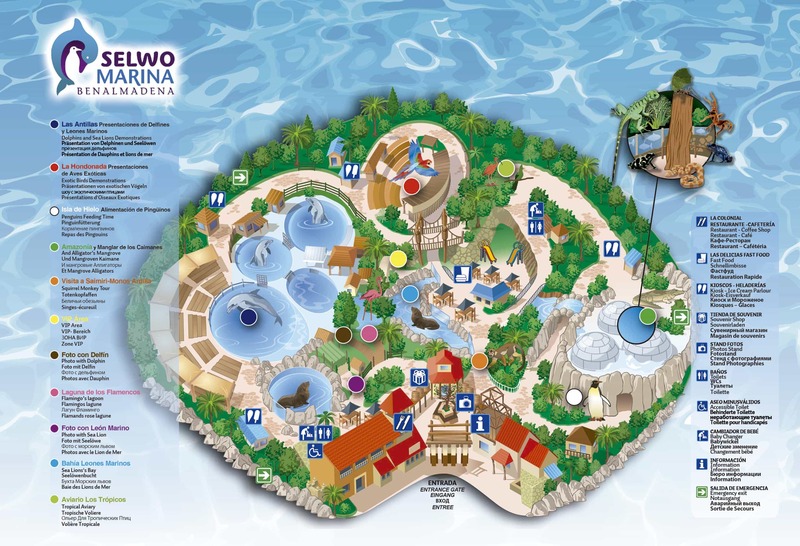 Selwo Marina is a very recommendable leisure activity option, especially for the children. Both children and adults will enjoy meeting all kinds of animals. In this zone of the aquarium you will be able to meet different species of penguins. 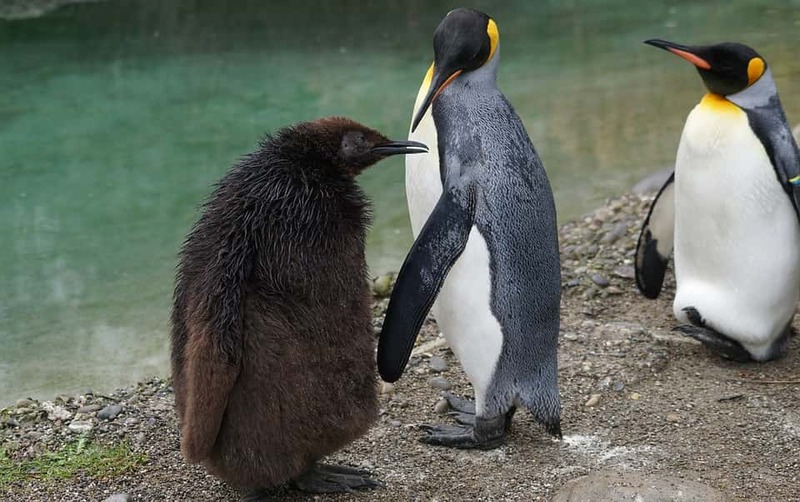 You will find King, Magellan, Juanito and Macaroni Penguins. Ice Island faithfully reproduces the natural habitat so that these adorable birds feel at home. There is natural snow and a large saltwater pool. Penguins live near the sea, south of the equator. Depending on the species, they can be found both in the coldest places on earth and in places where temperatures are somewhat warmer. Typically, penguins spend most of their time in the water where, thanks to their feathers, they can maintain a regulated temperature. Their preference for cold water currents is due to the increased ease with which they can get food. To build their nests they use the materials they find in the surroundings. They take care of their babies until they can go out into the water to feed themselves. In Selwo Marina there are interesting and educational talks about these nice animals. Learn about the main differences and similarities between species, how they feed and the great skills they have inside the water. In the Antilles the visitor will enter the Caribbean. Thanks to a large installation of saltwater pools with transparent fronts you will be able to learn about dolphins and sea lions. There is a recreation of a natural bay where you can take a refreshing swim with these friendly animals. The attribute by which everyone knows dolphins is their intelligence, far superior to the intellect of other aquatic animals. The dolphin is an animal that lives in all the seas of any ocean, you can even see them if you are lucky in our coasts. The dolphin is curious by nature, it is not uncommon to see them playing with the wake of boats. In Selwo Marina there are dolphin shows where you will learn all the details of these intelligent mammals during a demonstration. Sea lions can live both in the cold Arctic and in the tropics. Curiously, there are no sea lions in the Atlantic Ocean, but there are in the other oceans of the world. 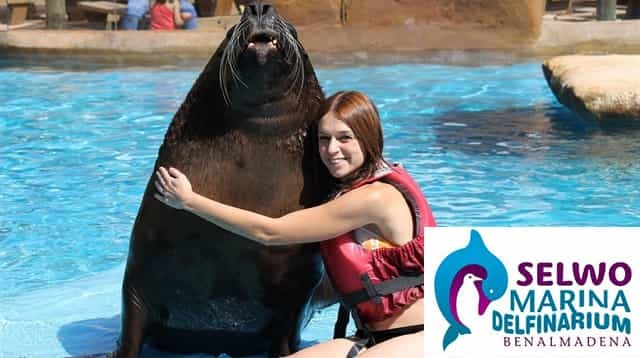 In the park there are fun and entertaining demonstrations where you will learn about some of the main peculiarities and features of these cute animals; do you know how a sea lion differs from a seal? Flamingos can be found anywhere in the world. They prefer areas that offer them water and mud, so it is common to find them in lagoons, lakes and swamps. In Malaga a very popular place to meet these striking birds is in the Laguna de Fuente de Piedra. If you visit Selwo Marina you will also find them in the Laguna de los Flamencos. This area of the park is where the exotic birds of the Amazon in South America are presented. 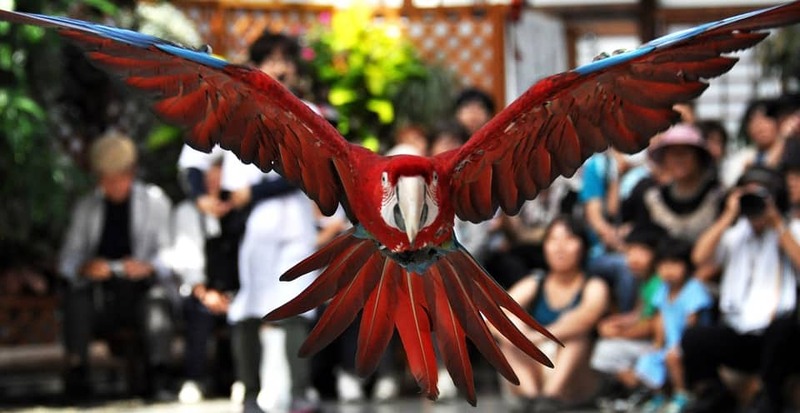 You will find cockatoos, macaws and yacos among other species. In the Hondonada there is also a children’s playground with swings and slides ideal for them. In the Cabaña de las Delicias you can have a drink while the children have fun. In this area of Selwo Marina there is an exotic birds show. You can see how they fly and behave in their natural environment. Come and visit this space reserved for typical species of the Tropic such as the Muntjac , the White Head Saki or the Scarlet Ibis. Muntjac is a ruminant that shares many similarities with deer. It lives in tropical areas and is native to the forests of South Asia. The habitat of this primate is in tropical rainforests of Venezuela and north-western Brazil. It is active during the day and is arboreal, although it sometimes descends to the lower branches of trees in search of food. This area is dedicated to the Amazon, a vast rainforest that is home to half of the planet’s animal species, many of them still unknown. Within Amazonia you will find aquariums that recreate the territories of the Amazon River with species such as the venomous arrow frog, the tarantula or the ocellated ray. In the aquariums you will find fish, reptiles and amphibians that inhabit the river bed. There are Matamata or yellow head turtles, red piranha, crocodiles or even arboreal boas. There is a complex anthill of leafcutter ants that offers you the chance to observe the life of these active insects both outdoors and underground. The VIP visit to Selwo Marina also includes getting up close and personal with some of the park’s most emblematic species such as the sea lion, dolphins and penguins. You can access the indoor facilities to learn how they live and feed them. If you are interested in learning more about the life of these animals and want a VIP visit you must make a reservation by phone at 951 560 324. Adults from 11 to 65 years old: 15.90€. Children from 3 to 10 years old: 13.50€. Selwo Marina is open from 10 am to 6 pm. If you want to enjoy Selwo Marina, Selwo Aventura in Estepona and Benalmadena cable car all year round, you can buy a season pass for 76€. Not only you can see marine mammals up close; you can also participate in special programs that allow close encounters with dolphins and you can even swim with sea lions. The only requirements are to be over 7 years old and to know how to swim. Click on the image to access a larger map. You can also discover animals from the Caribbean, the Amazon and the eternal ice of the South Pole or enjoy an exclusive VIP Tour.